This weeks scheduled maintenance is estimated to be 7 hours long and contains over 80 changes & updates. Following this maintenance players will be able to enjoy the new Sticker UI, which allows you to extend your in-game interface outside of the game window along with many other updates. This weeks, the patch will be ~1000MB in size. Golden Flondor Goose Egg Event has ended. Sticker UI that will allow users to drag some UI elements out of the game screen has been added. When Sticker UI function is activated, it will keep running outside the game screen even if other windows are turned on. However, some of the functions cannot be performed in Sticker UI window. When the pop-up is released, the window will reopen. When a window is dragged out of the game screen, it cannot be closed with the ESC key. The window can only be turned off by clicking the X button or releasing pop-up status then turning it off. When minimizing the game screen to tray, the Sticker UI will disappear. Sticker UI will reset in /reloadui situations (server change, resurrecting in nodes after death, etc.). Screens without render modes cannot use the Sticker UI (Ex. If World Map is turned on when Inventory is open, Inventory pop-up window will black out and no action can be taken). Drag-and-drop function is allowed only in the Sticker UI and in-game screen (Not in Windows screen). Marketplace Sticker UI can only be applied in Marketplace Panel through Game Options. Marketplace through Maids and NPCs are not available. Last Server Connected and Random Server functions have been added to the bottom part of the server list window which appears upon connecting to the game. Last Server Connected will show the server a player has most recently connected to, and players may now click it to reconnect. Adventurers who cannot connect to Olvia Server cannot connect to it even if Random Server is selected. Adventurers who can connect to Olvia will randomly connect to one of all servers, including Olvia Servers, by selecting Random Server. Fixed the issue where frame reduction occurred sometimes with the Equipment Selection UI while performing Recover Max Durability. Minimap-related functions like Minimap rotation and NPC spotter have been fixed to perform normally. Some areas of Iliya Island have turned from Safe Zone to Combat Zone. Fixed the issue where Herio in Crioville became invisible when players were talking to him. Fixed the issue where crows near Kasula Farm seemed to be flying through-and-above grounds. Fixed the issue where Cyclops conversing with the Crio in Crioville appeared to be Quest Target when it wasn’t. Title of <Cannon Maker> has been added to Vype Stoner of Northern Heidel Quarry. Katan Recruit, the target of quest [Daily] Training of the Solemn Martial Law, will now have more natural running motion. Fixed the issue where a character got stunned after falling down and was attacked with a skill that requires Black Spirit’s Rage. Accuracy has been greatly increased when a Summoned creature attacks installments during Siege War. All classes now close their eyes when they lie down on the bed. 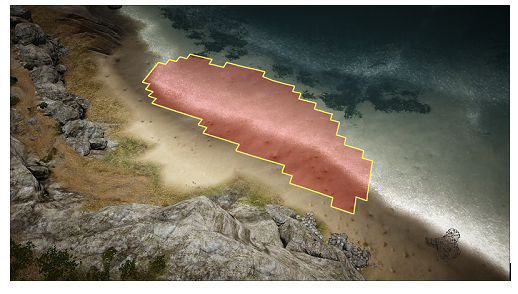 Fixed the issue where damage was not applied when a character fell from a cliff and landed on a ship. Players can now run, roll, or move in a sitting posture with a Matchlock or a Hunting Musket equipped. Movement Speed has been improved when a Matchlock or a Hunting Musket is equipped and the number of bullets for reloading has been changed to two. Effects for Matchlock and Hunting Musket equipped have been improved. Players cannot fire Matchlock or Hunting Musket when mounted on a Horse with a two-seater skill. Players can no longer sit on the passenger seat of a horse with 2-seater skill when a Musket is equipped. Strength EXP will not be earned when swimming with Trade Items on. Fixed the issue where food and a dining table around did not disappear when a character fell into water while eating. Icons for Black Spirit’s Skills in all classes have been changed. A small icon of Black Spirit will appear on a red outer line of all Black Spirit’s Skills. Fixed the issue where the skill Flow: Ankle Break’s Down Smash was not always applied properly. Jumping motion when switching from Great Sword to Longsword has been made more natural looking. The skill Flow: Ankle Break has been greatly improved. Attack Range has changed, and damage inflicted has greatly increased. Down Smash effect will only be applied in PVP. Combos from one skill to another will be performed more naturally. Description of ‘Hold LMB to perform extra hit’ has been added to the skill description. Effects based on proper range will be displayed. Effects for the skill Grave Digging have been improved. The combo will now be able to be performed faster when using Flow: Ankle Break after using Flow Tempest and Flow: Reckless Blow. Switching weapons in Non-combat, Longsword combat, and/or Great Sword Combat has been made more natural. Fixed the issue where Down Smash for Merciless skill sometimes inflicted less damage. Fixed the issue where graphics for shoulder pads weren’t displayed properly for a Warrior sitting down with the Atanis Armor equipped. Fixed the issue where blade effects weren’t displayed properly for the Warrior skills Grave Digging and Ankle Break. Text indicating the pushing effect has been added to the skill description of the skill Will of the Wind. Fixed the issue where Spirit's Shackle’s hit damage occurred only once. Fixed the issue where the Down Smash effect did not apply properly when the skill Penetrating Wind was used in PVP. Target count will now be properly applied when using Will of the Wind in horseback combat. Fixed the unnatural movements when using Evasive Explosive Shot after falling off from a high place. Forward hit Stiffness effect has been changed to Stun effect for the skill Nature’s Tremble. PVE damage for the skill Wailing Wind has been increased. Damage will not be reduced if used in cooldown. Down Attack will be applied when using the skill Darkness Released during the cooldown time. Descriptions for the following skills have been edited. (Only the descriptions have changed and skill effects remain the same). Ultimate: Shadow Eruption: Description related to Air Attack has been added. Fixed the issue where Action Restriction occurred during cooldown time of the skill Darkness Released IV. Chop attack damage for the skill Soul Harvest has been increased. Fixed the issue where the Accuracy Increase of the skill Absolute Darkness was not applied properly at times. Accuracy for the skill Scattering Shadow has been increased. The text of ‘Invincible while skill is in effect’ has been added to the description of the skill Shadow Leap. Description of the skill Dead Hunt has been edited. Fixed the error where Grim Reaper's Judgment would auto-activate in certain situations. Graphics of the waist part of the outfit Lahr Arcien (R) will be displayed more naturally. 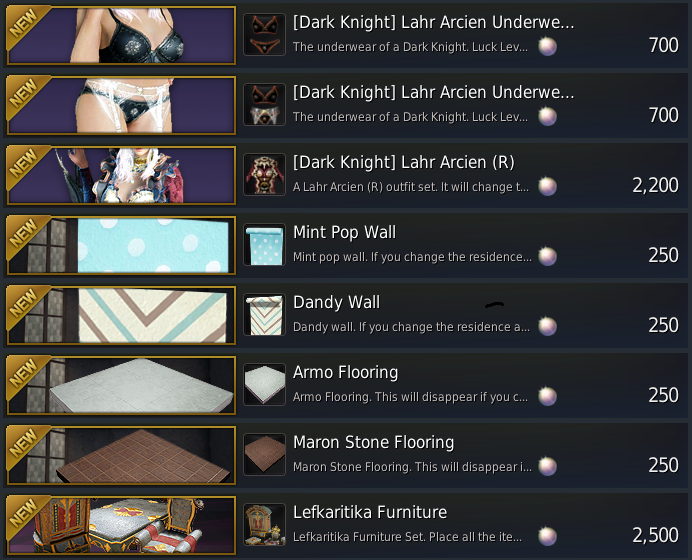 Graphic glitches for Le Vladian Underwear/Le Vladian Underwear (No Stockings) in Pearl Shop or Dye Screen have been adjusted. PVE damage for the skill Cartian's Nightmare has been increased. Fixed the issue where Smash damage after jumping for the skill Rock Smash was not applied properly at times. PVE damage for the skill Flow: Slugfest has been increased. Headbutt motion when Grappling fails during the skill Corpse Storm will now be displayed properly. Fixed the issue where Lahr Arcien Armor showed up when the durability wore off for the Atanis Outfit of the Berserker. Fixed the graphic glitches in the Atanis Outfit of the Berserker. Fixed the issue where the buckle ornament size of the Atanis Outfit of the Berserker would change greatly while the character was running. PVE damage for the skill Blasting has been increased. Attack Range of the skill Flurry of Kicks will now be properly applied. Targets attacked by Heilang will not be inflicted with Stiffness during the cooldown time of the skill Heilang: Void Lightning. Ultimate: Shadow Eruption: Information about Air Smash has been deleted. Heilang: Scratch: If used during cooldown → If used during cooldown or while riding Heilang. Celestial Bo Staff Training: Forward Attack total X4 times → Forward Attack total X5 times. Deleted the text of 'Heilang will use its skills aggressively' in the descriptions of Whiplash, Heilang: Upward Claw, and Heilang: Lightning of Earth. PVE damages for the skills Allround Spinner I ~ III have been increased. Description of the skill Whiplash III has been edited. Deleted the text of ‘Attack range increase depending on skill level’ in the description of the skill Void Lightning. Actual range of the skill remains the same as before. Echo Pierce has been improved. Calculations of the damage has been changed which modifies the damage stats in the skill description. The calculation of the damage being applied has been changed, causing the damage stats in the skill description to be changed as well. The skill’s stats have been reduced but due to changes in the calculations, actual PVE damage has been increased and PVP damage remains the same. Added the text ‘Spins the target upon hit (not in PVP)’ in the skill’s description. Horseback combat command tooltip content of the skills Sword of Judgment and Ultimate: Severing Light have been removed. Fixed the issue where HP Recovery effect was not always being applied properly upon using the skill Severing Light. Fixed the issue where the skill Flow: Sharp Counter did not apply the equivalent attack damage with the skill Just Counter. Damage for the skill Sharp Light IV has been increased. Hit count for the skill Sharp Light III has been increased from 2 hits to 3 hits. Fixed the issue where SP was not recovered while using Skyward Strike during Sprint. The skill Divine Power can now be used in Lancia combat. Fixed the issue where Spin Counter damage while in Counter was not applied properly. Fixed the issue where the skill Shining Dash only applied X1 hit. Increased the attack count of the skill Shield Throw. Forward Slash: Added the description of ‘Pushes the target on hits (not in PVP) & Casting Speed and Attack Range increases. Shield Strike: Added the description related to ‘Push effects’ on all level skills. Shield Strike III: Removed the text ‘if the first and second hits succeed’ from the skill description. Strong Defense: Description of ‘a successful Counter Damage inflicting Stiffness on target while on guard’ has been added. Attack Range of the skill Divine Power has increased. Switching from a non-combat mode or Lancia combat mode to Long Sword combat mode will now be faster. The player will receive an Accuracy increase buff upon using the skill Heaven’s Echo in horseback combat. Description of the the skill Sanctitas de Enslar has been edited. Added the information related to Floating in the description of the skill Flow: Lucem Fluxum. Fixed the issue where the add-on effects of the skill Shining Dash were not applied properly. The skill Shield Throw used in horseback combat will now apply proper damage. Attack Range and skill effects of the skills Divine Power, Ultimate: Divine Power, and Glaring Slash will all be equivalent now. Removed the Push effect on the monsters when using the skills Verdict: Lancia Iustitiae and Flow: Revelation Sanctus. PVE damage for the skill Terra Sancta has been increased, and the skill will activate faster. PVE damage for the skill Ultimate: Blitz Stab has been increased. PVE damage for the skill Hastiludium has been increased. PVE damage for the skill Sacrum Ferit has been increased. Knockback will be applied to Blitz Stab and Ultimate: Blitz Stab after these skills are used after other skills. Gravity Hit count of the skill Meteor Shower has been increased to 4 hits. Changed the unnatural position of the hands when carrying trade items to appear more naturally. Mana Absorption: Added the text ‘Stun on a good finishing blow’ to the skill description. Dagger Stab: Description of ‘Stiffness not applied during cooldown’ has been added. Changed the unnatural movement when switching weapons using ‘C’ key in awakening weapon combat mode. Fixed the issue where MP was slightly recovered during cooldown of the skill Water Sphere. Special action for the outfit Sage's Memory has been changed. Fixed the issue where additional MP was drained when combo was not performed while using the skill Yoke of Ordeal. Fixed the issue where the character could use the skill Psyche of Aad Sphera while moving when the skill was activated through Quick Slot. Adjusted the unnatural movements of normal attacks inflicted while sprinting with all stamina used up in Aad Sphera combat mode. Improved the graphics of Shudad Armor. Fixed the issue where forward guard was applied abnormally when switching to staff in awakening weapon combat mode. Stub Arrow: Evasive Shot will now apply proper hit damage. Left and right movements have been made more natural when using the skill Whirlwind Cut: Cyclone. Skill Range increase effect will be properly applied for the skills Ultimate: Sweep Kick and Ultimate: Roundhouse Kick. Charged Stub Arrow Damage will be properly applied in horseback combat. Invincible effect will be applied properly when the skill Tiger Blade ends. Skill Add-On effects for the skill Carver will now be applied properly. Nemesis Slash I ~ II: - Added the description that target will be inflicted with Stiffness on a good hit. Damages of the skills Whirlwind Cut, Dragon Bite, and Divider with the Tiger Blade will now be properly applied. Fixed the issue where Flow: Nemesis Slash could not be performed in a combo after using Crust Crusher. Description related to Stiffness has been added to the skill Flow: Backflow. (Only the descriptions have changed and skill effects remain the same). Description related to Air Attack has been added to the skill description of Twister. PVE damage for the skill Twister has been increased. PVE damage for the skill Crosscut has been increased. The text of ‘(Not in PVP)’ has been added to forward attack related description in the skill description of Crescent Blade Training. Only the description has changed, and the actual effect applied remains the same as before. Fixed the graphic glitches in the knee part of a Musa wearing Atanis Armor in combat stance. Fixed the graphic glitches in the belt part of the Musa wearing armor in normal stance. Fixed the graphic glitches in the gloves part of the Musa wearing Atanis Armor. Fixed the issue where Flow: Cloud Stab could be learned without having learned Moonrise before. PVE damage for the skill Flow: Cloud Stub has been increased. PVE damage for the skill Tenacious Edge has been increased. Fixed the issue where damage was not properly applied when the skill Kunai: Evasive Throw was used after learning Kunai Throw III. The number of hits for the skill Sudden Decapitation on a double sword stance has been increased. The issue where Bound effect wasn’t applied when using the skill Sudden Decapitation on a double sword stance has been fixed. Players can now repeatedly use the skill Murderous Intent and Ninja Step when using the skill Corrupt Sword Dance or Sudden Decapitation on a double sword stance. Players can now repeatedly use the skill Murderous Intent and Ninja Step when using the skill Dual Sword Canceling. The text of “100% Critical Hit” has been added on the description of the skill Aftershock. Attack Range of the skill Lethal Spin Spree has slightly increased and the effects have been enhanced. Effects of the skill Flow: Wrath have been enhanced. Cooldown time for the skill Lunar Dash has been reduced by 1 sec. Damage of the skill Shuriken: Toxic will now be properly applied. Players can now use the skill Ghost Step and Half Moon Slash when using the skill Lunar Veil. Slightly less stamina will be consumed while Sprinting in Kriegsmesser/Vediant mode. The following skills will be available via Quick Slot in Vediant combat mode. Nocturne is now activated faster. Enforcement IV will now apply proper hit damage. Fixed the issue of Flow: Termination not applying Floating effect upon learning Vedir’s Dogma. The motion of jumping while going into non-combat mode from Phantom Blade mode has been made more natural. The arm position in Kriegsmesser combat mode while equipping Snowflake Costume has been made more natural. Corrupt Ground will apply proper hit damage. Hidden Strike III will have proper critical hit rate. Fixed the issue where Javelin Throw from a Guild Elephant was not applying proper damage. New Life Clothes related to Sailing have been added. Players can obtain most Sailor’s Clothes except for Silver Embroidered Sailor’s Clothes which will be included in a later patch. Some of Sailing-related costumes include Mermaid’s Hope effect which will decrease the chance of the player running into typhoons, phantom ships, and other disturbances when at sea. Ship Repair Kit has been added. Ship Repair Kit will recover greater durability of the Galley compared to Ship Repair Material. Ship Repair Kit can be produced in the 4th stage of the Ship Part Workshop. As Enhancement chance has increased, less Black Stone is required for Force-enhancement. The extracted amount has been decreased for the following Enhanced gear items when they are extracted with a Black Stone. Marketplace listing price for the following Enhanced gear has been reduced. On first-time uses of the following items, an Item Use Confirmation window will be activated. After pressing (Enter) or consenting to the use of an item from the confirmation window, any misuse of an item cannot be reversed. The icon for Inventory Slot Expansion Coupon received as a quest reward has been changed. The following items have had exponential increase in Accuracy. When catching a Horse or a Baby Elephant, it was adjusted so that the Capturing Rope can only be thrown from at least 10M away from the target. Upon use of [Event] Horse Flute (7 Days), the Horse Flute will go into the player’s regular Inventory. Crafting Note images for the following items have been modified to differ from the actual items’ icons. The text of ‘Use SPACE bar to throw away the rope’ has been added to when players use rope items. Crystals will not be able to be infused on unbound Pearl Costumes. A new crystal named Spirit Crystal has been added. Serendian Soldier Suit and Beginner’s Serendian Soldier Suit have been modified to include a helmet. Magic Power accessories can now be returned with Seals of Promise and Tokens of Promise. 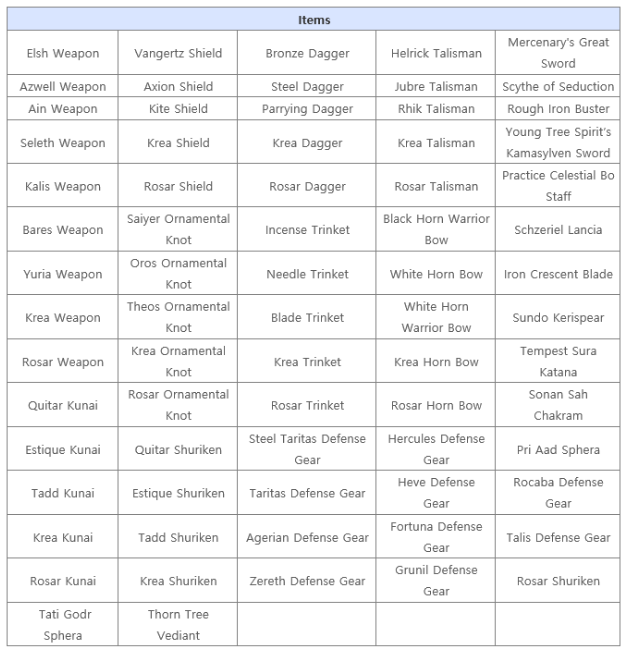 The number of items returned (Seals of Promise X3/X15/X35, Tokens of Promise X3/X8/X18) varies on the grade of the accessories. [Event] Sweet Candy and [Event] Paella will not share cooldown time. Buff Effect descriptions for the following elixirs have been modified. Item description for Fine Fancy Fur has been modified. [Dark Knight] Karlstein Weapon & Outfit Set (7 Days) will not expire when it’s in box state. If opened, the items inside will be obtained into the player’s regular inventory. Fixed the issue where chandeliers were not always placed where you tried to install them. Male characters “Serendian Blacksmith” outfits having a different look than the actual outfit has been fixed. Upon Enhancement, players can now choose between Enhancement types. Enhancement types are divided into [Enhance] and [Durable]. Now players can choose the Enhancement type when placing relevant gear into the Enhancement slot. Choosing [Enhance] will increase the success rate of the enhancement attempt, at the risk of additional durability loss should a failure occur. Choosing [Durable] will decrease the success rate of the enhancement attempt, but minimize the amount of durability lost if the enhancement fails. Players with a Magnate buff will receive the effect of winning the Bargain Game without having to play the actual Bargain Game. Fixed the issue where the image of the Brown Cream Puppy in the selection window differed from the actual image when Pet Appearance Change Coupon was used. Some Wall Shelf furniture have been modified to allow item placement on them. However, items bigger than the shelves cannot be placed. Title descriptions for Stone Tail Bison and Desert Crab have been updated. Repetitive or similarly-worded titles have been changed. Swordfish description in the Fish Guide has been changed. Problems in interactions with Golden Treasure Chest have been fixed. Flame Towers sometimes disappearing during Siege Wars has been fixed. Overlapping of Valencia Table and Handcrafted Table with other furniture has been fixed. Navigation deviating out of the defined path in some regions of Altinova has been fixed. Challenges based on Sailing level have been added. Force PVP ON/OFF mode will be maintained when game client is restarted. The issue of connected horses not showing up when retrieving wagons has been fixed. Recovery cost for mounts after being branded will be reduced even if they are not checked in. Characters will not collide with destroyed Shingijeon anymore. Depending on the accumulated price, the Magnate effect will be applied only upon purchasing Limited Trade Items. Fixed the issue where towns without stables did not allow sale of horses. However, horses with prices exceeding the silver weight limit of a player cannot be sold. In Node War / Siege servers, World Boss Monsters will not spawn for 15 mins prior to the start or after the end of the war. The items marked Bid on the Marketplace can now be purchased at a price higher than the minimum price. Fixed the issue where players could not participate in Limited Red Battlefield. Contents of the in-game TIP found in the bottom-left corner have been updated. New monsters for hunting have been added to Balenos Eastern Mountains. Players can hunt using a Musket, and items can be obtained using a Butcher Knife afterwards. Upon butchering Giant Boars, Pork has been added to the loot table. The location of Khuruto Chaser found near Atu of Mediah Abandoned Iron Mine has been changed. More monsters can now be found in the Manes Hideout. The below Monsters will be on standby above the surface in Soldier's Grave in Mediah. The below Monsters have been added to the area of Soldier’s Grave. Fixed the issue where players could sometimes target Guild Raid Boss Ferrid when it was vanishing for not being engaged in combat. Fixed the issue where the Quest Target mark was not showing up on some monsters. Aura of Failed Kzarka will not be marked on the Quest Targets anymore. More monsters can now be found in Taphtar Plain of Valencia. Centaurus will now throw fewer javelins but attack from a closer range. EXP gain and Black Stone drop rate has slightly increased for defeating these monsters. Centaur Axeman guarding the South Gate if Cadry Ruins has been relocated. Combat patterns for Mutant Troll and Mutant Ogre have been changed. If HP falls below certain level, they will attack more fiercely. Mutant Troll’s location has slightly changed. Fixed the issue where some Valencia quests were mislabeled as Mediah quests. The starting NPC of the quest ‘Parasitic Bees’ Weakness’ has been changed. Knowledge of Black Marlin has been edited. Method for gaining the knowledge of the Central Neutral Zone has been changed. Quest conditions of the quest ‘Through the Rough Tides’ have changed. Receive ‘Old Moon Trade Item’ from Sihuram of the Port Ratt and deliver it to the target NPC to complete the quest. Fixed the issue where the knowledge of some Node Managers in islands could not be gained through conversation. Knowledge can be gained by talking with relevant Node Manager for the first time. If players had talked to the NPC before the update, they can talk with the NPC again in order to regain the Knowledge. A new story quest in Calpheon, ‘Monarch of Darkness,’ has been added. ‘Monarch of Darkness’ is comprised of 25 quests in total. The quest can be accepted by talking with Elgriffin of the Delphe Outpost for characters with Lv. 50 + who have completed the [Boss] Witch-Hunting quest. Adventurers who have completed Belmorn-related quests can restart the Story Quest from the beginning. Quest Acceptance Conditions for the following Tutorial Quests have been changed. Any character with Lv. 1 + who haven’t completed the quest may accept it. Magic Armor, Sub-weapon Exchange quests have been changed from Family-bound to Character-bound and completed history has been reset. For Families that have completed Magic Armor, Sub-weapon Exchange I quest, 1 additional Magic Armor and Sub-weapon has been given so that the quest can be challenged again. Magic Armor, Sub-weapon Exchange I quest has been changed to be available only in Calpheon. ‘What Happened at the Refugee Camp?’ Fixed to show quest target location more easily. ‘Spirit Plant Grow With Devotion.’ Fixed the issue where Processing methods for Organic Fertilizer was wrong in the quest. Knowledge of Nutmeg has been edited. ‘The Horse that Doesn’t Flee,’ a prerequisite quest for ‘My Little First Pony,’ has been added. ‘The Horse that Doesn’t Flee’ is a Tutorial Quest to catch wild horses. Contribution EXP rewarded for completing some of daily quests in Balenos, Serendia, and Calpheon has been increased. Classifications of Cuvier and Smokey Chromis have been changed from Rare Fish to Big Fish. From Sophistication IV, Max Energy obtained will be 1. During the quest ‘Donatt, the Forgotten Name,’ Navigation has been facilitated by relocating the NPC of Glish from whom players can attain the knowledge of Freharau's Scar. Tutorial related to ‘Wall Climbing’ has been added. Upon accepting [Awakening] Wizard’s Altar quest, Tutorial will become optional. The quest can be completed without going through the tutorial. Tutorial will disappear upon completion of the quest. Fixed the issue where Knowledge could not be obtained sometimes after talking with NPCs for not having enough Inventory space or carrying too much weight. Windows like Attendance Reward and Event Screens that appear all at once will now be activated in proper order. The ESC key will no longer work for closing normal screenshot mode and Taking Portraits in the Beauty window. Purchase button will be deactivated for items that cannot be purchased due to lack of Loyalties in the Loyalty shop. Fixed the issue where Imperial Delivery NPC icon of Port Ratt would not reveal Imperial Delivery info on the World Map. Fixed the issue where Action Combo Guide covered the middle of the screen. [Combat] button has been changed to [Main Weapon] in the Skills window. Fixed the issue where name of some Forts did not appear in the World Map. When transferring stackable items from Inventory to Storage, players can now choose to show maximum amount as the displayed amount on the input screen. By checking ‘Show Maximum’ from the window to transfer Inventory items to storage, maximum amount transferable will be displayed on default. Fixed the issue where some description windows would not appear on the bottom-right part of the mouse cursor. Reset time of Imperial Delivery has been added to the trade info window in the ESC menu. World Map Tutorial button will be activated on default now. Character Class, Level, and Character Name will now always appear on icons of party members in the World Map. Camera Speed Up/Down and Player’s Current Location categories have been added in the UI HotKey option. Dialogue Window ON/OFF state will remain as selected in the UI Edit mode even after reconnecting to the game. Even if font size is changed, font size for introducing guilds will not be changed. Fixed the issue where death info was covered up by the distance info. of the deceased party member. Information on the players’ gardens can now be checked under their My Gardens list. Order of servers will now appear randomly in the Server Selection screen. Fixed the issue where notification message appeared in an odd place when extracting enhanced items after interface size has been changed. Icons of party members will not be displayed anymore when General Information is changed to Other Information in the World Map filters. Fixed the issue where icons of party members was not displayed properly at times. Attendance Reward window will not auto-activate when weekend additional attendance rewards are given out. It will be activated when moving to Safe Zone or when reconnected. Attendance Reward window will not auto-activate when the game is connected with a character with Lv. 6 and below. Upon achieving Lv. 6, Attendance Reward window will auto-activate. Monsters for Hunting will now show up with Hunting (Deer-like) icon in the Minimap. Fixed the issue where Guild Fund’s text in the Guild Member Status window would overlap with other texts. Fixed the issue where new Knowledge icon in the top-left corner of the Knowledge window would overlap with other icons. Durability of selected item will not appear while performing Recover Max Durability. Interaction key can now be changed to other keys in the UI HotKey option. Scroll will not reset anymore when clicking receive/cancel in Storage Transport window. Main Server setting UI in the Server Selection window has been improved. Total number of Titles per category in the [Profile - Title] section has been added. Fixed the issue where the UI of the party member remained in the World Map when the Location UI of the World Map Filter was turned on and off. World Raid Boss Karanda’s name and Minimap icon will now appear properly. so Patch Notes are posted in advanced, just hidden until it's kinda ready? WHY ARE 50% OF THE PATCH NOTES INCORRECT!? Players can now repeatedly use the skill Murderous Intent and Ninja Step when using the skill Corrupt Sword Dance or Sudden Decapitation on a double sword stance. ????????????????????????????????????? Players can now repeatedly use the skill Murderous Intent and Ninja Step when using the skill Dual Sword Canceling.???????????????????????? Oh, why it took so long? ----- your mindless tamer changes. Keep buffing warriors lmao.